Blue evil eye diamond necklace. 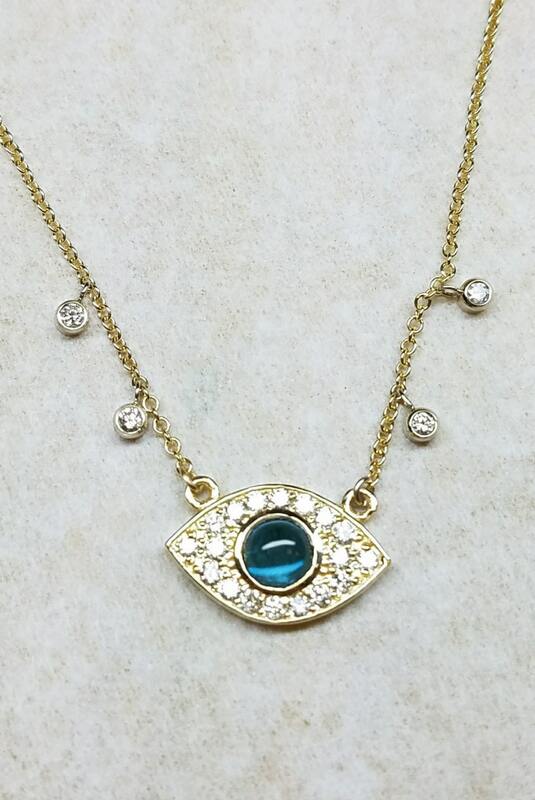 This beautiful Blue Evil Eye Necklace is made with 18 karat yellow gold and has a total of 0.48 carat of diamonds, G in color and VS in clarity and a cabochon cut blue topaz, the chain is 18 inches and adjustable to 16 inches. Perfect necklace for Mother's Day, Christmas, birthday, anniversary, valentine's day. Great Necklace to wear everyday. Perfect for layering. The charm on this necklace symbolizes good luck and safe keeping. - This Evil eye necklace is made to order, please allow 7 days before shipping. - Available in white, yellow, rose gold. - Different chain length available, please specify when placing the order.